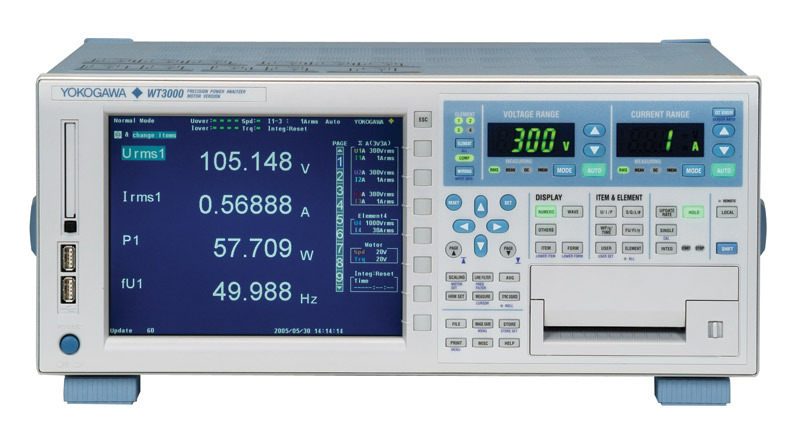 The WT3000 is the ideal measurement solution for applications such as product efficiency testing, engineering, R&D work on inverters, motor drives, lighting systems and electronic ballasts, UPS systems, aircraft power systems, transformer testing and other power conversion devices. With basic power accuracy of ±0.02% reading, DC and 0.1 Hz-1 MHz measurement bandwidths, and up to four input elements, the WT3000 provides higher-accuracy measurement of I/O efficiency. Advanced computation function: Waveform computation, FFT analysis, waveform sampling data saving. More Precise. More Bandwidth. More Features. The large, 8.4-inch liquid crystal display and the range indicator LEDs ensure good readability and make the system easy to use. Have you had problems or questions such as these? When working with efficiency-improvement evaluation data for a high-efficiency motor, improvements cannot be seen unless measurements are taken with very high precision. 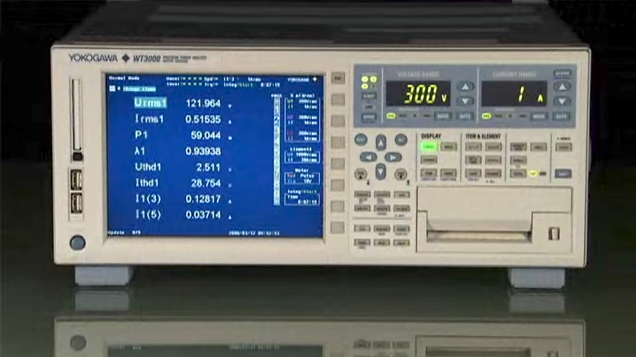 Measurement efficiency is poor during power measurements and power supply quality measurements. You measure voltage using mean values out of habit, and are wondering if that is really the best approach. *For answers to these questions, see applications page. In developing the WT3000, Yokogawa focused on improving efficiency in two basic areas. One goal was to obtain highly precise and simultaneously measurements of the power conversion efficiency of a piece of equipment. The other objective was to improve equipment evaluation efficiency by making simultaneous power evaluations and tests easier and faster. The Yokogawa WT2000 was very popular with users and considered highly reliable because of its high precision and excellent stability. The WT3000 is based on a measurement system which combines the measurement technology used in the WT2000 as well as other WT Series models. With the WT3000, we made further improvements to the basic performance specifications for even better functionality and reliability. We are confident users will appreciate these improvements to power and efficiency measurements thanks to the new power control technologies we have introduced. The WT3000 is the first model in the WT Series which is standard- equipped with a PC card slot (ATA flash card slot). This interface allows data to be saved quickly, so data processing time is reduced. The WT3000 is also standard-equipped with a GP-IB port. In addition, a serial (RS-232) port, Ethernet port, and USB port are available as options. The variety of interface choices allows customers to use the best interfaces for a wide variety of equipment, media, and network environments. 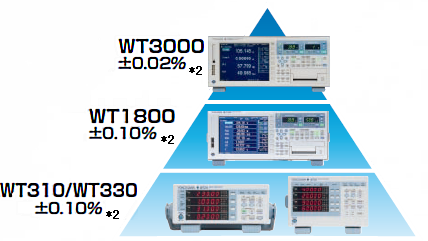 The WT3000 has the highest precision of all the Yokogawa power analyzers in the WT series. The models in the WT series are designed to meet a wide variety of user needs. The WT300 series is a high price-performance series which is very popular in production line applications. The WT1800 allows measurement data to be viewed in a variety of ways, including numerical value display, waveform display, and trend display capabilities. Deluxe instrument cart with adjustable shelf positioning. THE WT1800 and WT500 STORE function can only be used to record NUMERIC data. The WT1600 and WT3000 STORE function can be used to record both NUMERIC and WAVEFORM data.